Two boys from Victory Martial Arts Academy in Apollo Beach get an up-close look at some cownose rays at the newly opened Stingray Touch Experience exhibit at the Manatee Viewing Center. Visitors at the Tampa Electric Manatee Center got a special treat last Thursday when its new Stingray Touch Experience tank opened on site. Young and old alike appeared fascinated by the 13 cownose and two southern stingrays swimming at will across the newly constructed 10,000-gallon, 600-square-foot tank. 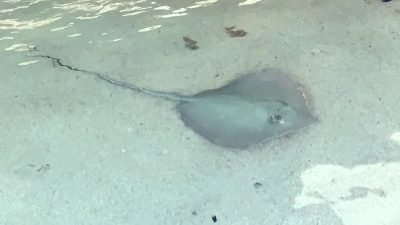 The exhibit will now be the winter home for the stingrays, which normally reside in the Tampa Bay Rays’ outfield touch exhibit at Tropicana Field in the summer. Although the children had the option of physically petting the rays on their wings, Zigre said they chose not to. About 50 people at a time are permitted to gather around the tank at any one time. Once each hour, the rays, which are fish, are given a 10- or 15-minute rest break. It’s a protocol established by The Florida Aquarium to keep them at their best, said Rob Lamke, the aquarium’s promotions manager. “The space is large enough for them to move around freely,” he said. A cownose ray emerges from the waters of the touch tank looking for food at the side where Florida Aquarium personnel feeds it every day. So do the rays like being petted? Two aquarium representatives will always be on hand during the viewing center’s hours of operation to monitor the crowd’s interaction with the rays and answer visitor questions. Manatee Viewing Center officials are equally as pleased. • The water in the touch tank is kept at 78 degrees. The oxygen, temperature and pump filtration status is accessed in real time by the aquarium’s animal care team via a web application, 24/7. An aquarium team of biologists and a veterinarian will provide 24-hour care for the animals. • The 13 cow nose rays originally came from the Gulf of Mexico. The two southern rays were born under human care. Andrea Sorbo, of St. 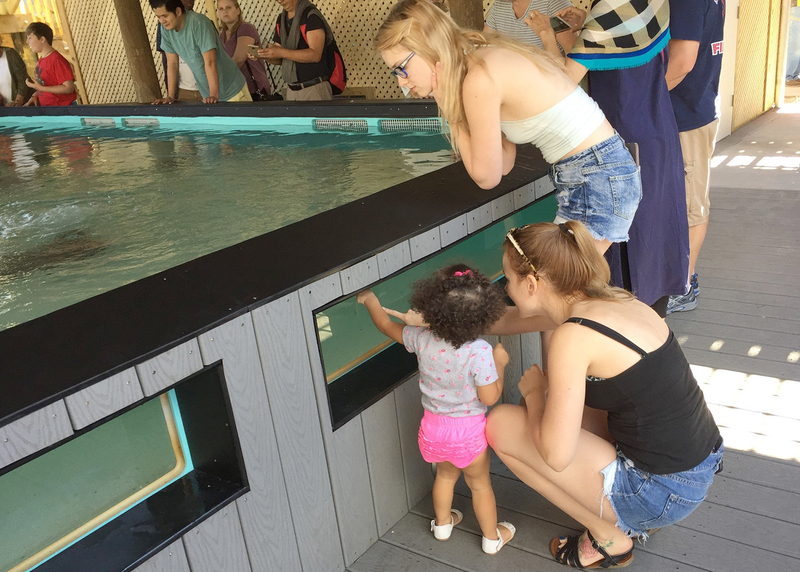 Cloud, Minn., and her daughter, Norah, 20 months, peek through glass windows installed on the sides of the Manatee Viewing Center’s rays touch tank on opening day of the exhibit. • The rays were transported from Tropicana Field in a large, 600-gallon transport carrier in a large box truck in two trips from Tropicana Field under the supervision of Mike Terrell, The Florida Aquarium’s director of animal husbandry, a team of biologists and an on-site veterinarian. 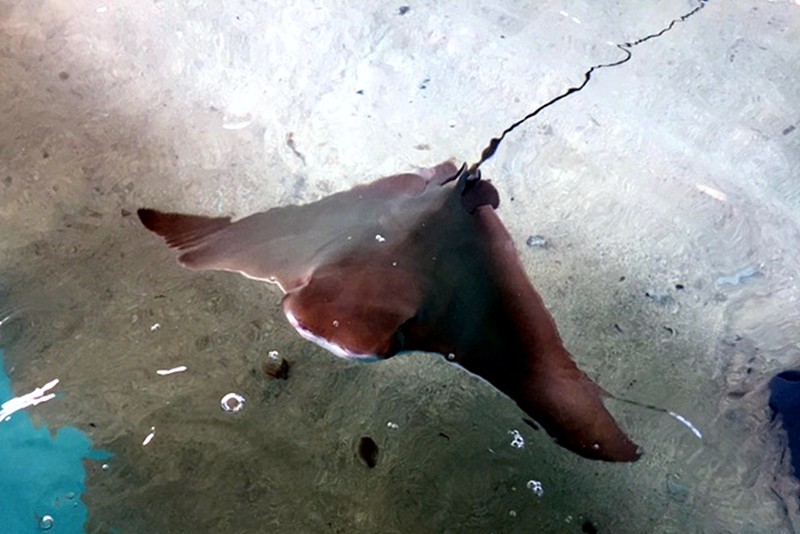 • The stingrays receive a scheduled medical exam, and their stingers are clipped off much like fingernails. • The rays will eat about 100 total pounds of chopped smelt, squid and capelin per week (twice daily except for Monday and Friday, when they will eat once), and a weekly dose of vitamins. • Stingrays are closely related to sharks. As cartilaginous fish, they’re supported by skeletons of cartilage instead of bones. They detect prey with sensors in their mouths called ampullae of Lorenzini. • Cownose rays can grow to a width of three feet; southern rays, five feet. 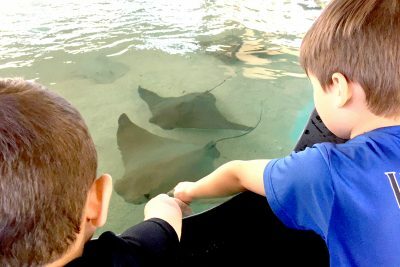 The Stingray Touch Experience is a key part of the Florida Conservation and Technology Center shared by The Florida Aquarium, TECO and the Florida Fish and Wildlife Conservation Commission. “This new experience offers the Manatee Viewing Center another way to educate guests about the natural environment and connect them with the species (that) make their home in Tampa Bay and rely on a healthy Tampa Bay ecosystem,” he said. For additional information, visit flaquarium.org, or tampaelectric.com/company/mvc/. 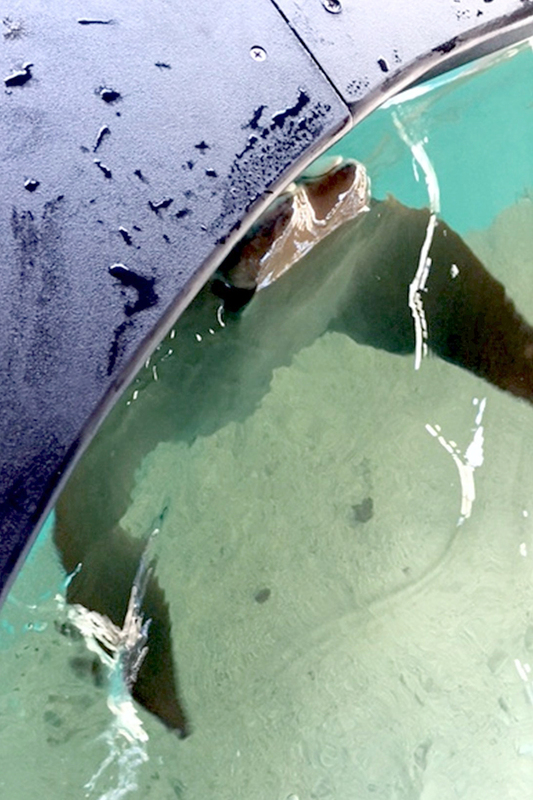 A Southern ray swims along the bottom of the touch tank at the Manatee Viewing Center. This stingray is commonly found in tropical and subtropical waters buried in the sand. Like all stingrays, this cownose stingray is closely related to a shark. As a cartilaginous fish, it’s supported by a skeleton of cartilage instead of bones. It can grow to a width of three feet. 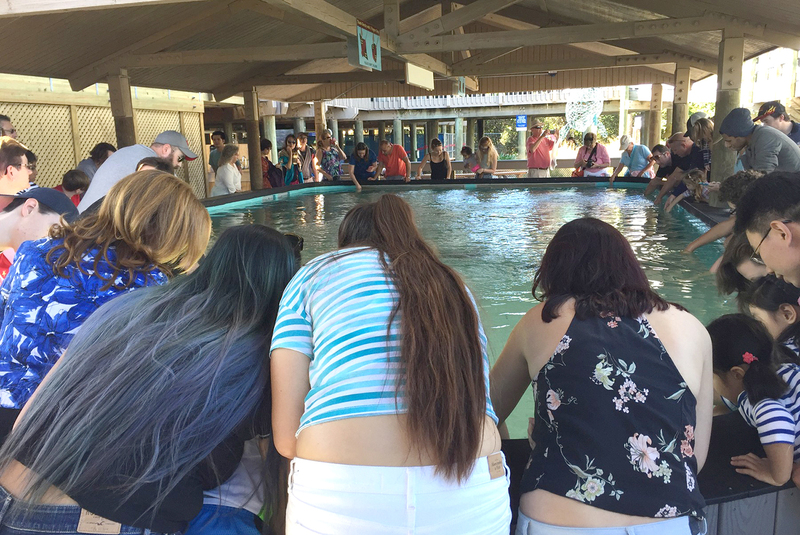 Folks of all ages surround the newly constructed 10,000-gallon, 600-square-foot rays touch tank at the Manatee Viewing Center. The tank is winter home to 13 cownose and two Southern rays.